I'm keeping this one, but showing it for the shape. 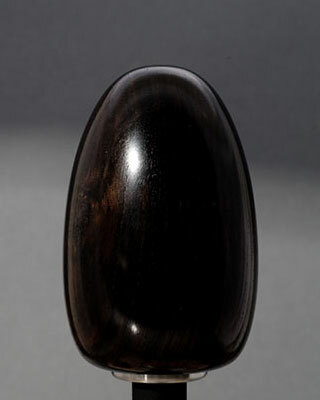 I will make other knobs in this shape upon request. The shape was inspired by the "handle" style shifting ergonomics used in some Le Mans race cars. 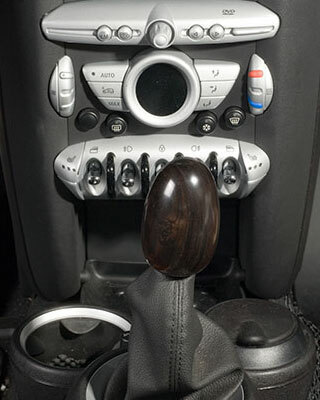 When driving with the #40 tall blackwood handle style knob I found that the narrowing at the top to be very comfortable. So this is a short knob with that style. If you like the short shifter, but want to try the handle style of shifting, this is a good choice. I like driving with it. Black and dark brown grain pattern. In bright light it has a nice glow to the grain.